Cost to install slab countertops varies greatly by region (and even by zip code). Get free estimates from countertop installers in your city. Cost to install slab countertops varies greatly by region (and even by zip code). Get free estimates from countertop installers in your city. The average cost of installing stone slab countertops is $2,700. Which factors can affect price? How much does it cost to install stone slab countertops? If you’ve been in any modern kitchen or bath lately, you’ve probably noticed a beautiful stone countertop that’s the shining star of the room. Granite is one of the most popular options, but there are many stone slabs that can be used for countertops, including marble and soapstone. Stone slab countertops refer to a broad group of materials that are quarried in large single slabs and cut to fit your space. While there are certainly many different home projects you can do yourself, installing a stone slab countertop is not a recommended DIY project. For one, those stone slabs are incredibly heavy! A 2cm-thick granite countertop weighs approximately 12.8 pounds per square foot. That means a 30 square foot slab weighs 384 pounds! Hiring a team of professionals to install the countertop for you ensures that the countertop will be installed safely and without damage to the stone or base. While every project is different, the average size of a stone slab is approximately 30 square feet. In addition, different types of stone slab material will vary in cost, but the national average for purchasing and installing a 30 sq.ft. stone slab countertop with a standard sink cutout and standard edge is approximately $1,630–$2,700. 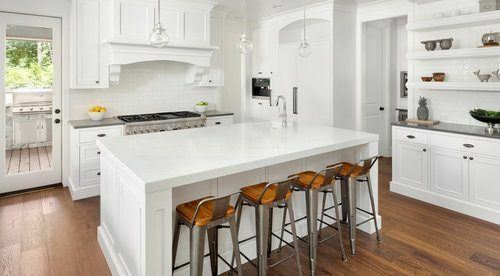 Slab countertops are incredibly popular right now, but as with all design considerations, there are upsides and downsides to be aware of. Stone slab countertops are unique. Each slab, even if it’s the same “color” will look slightly different from the others. This is because the mineral makeup varies, changing the patterns and textures of the stone. Other types of stone, like soapstone, develop a dark patina 1 over time, so the character of the countertop will change as the years pass. 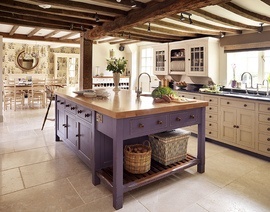 In addition to being unique, slab countertops have a long lifespan. With the right care, a slab countertop can last a literal lifetime, and some contractors estimate they can last over 100 years. Stone slabs require quite a bit of maintenance to keep looking as bright and polished as when they were new. Some types of stone are particularly susceptible to etching and scratches. In addition, stone, while seemingly solid, can actually be quite porous and can absorb liquids and stain if not cleaned immediately. To help prevent this, countertops are often coated with a sealant that needs to be reapplied periodically. The other factor to consider is that stone slab countertops can be very expensive, depending on the material. Some particularly unique stones, like lava or onyx, can be prohibitively expensive. Material. Stone is a broad category. There are many different types of stones, and each material is different, both in appearance and cost. There are even differences in price among similar materials. Granite, for example, comes in hundreds of color varieties, and the cost can vary significantly depending on the rarity of that particular granite. Thickness. 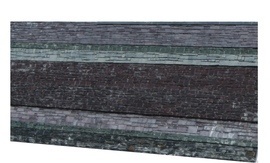 The industry standard for stone slab thickness is either 2cm or 3cm. Obviously, 3cm slabs are going to be heavier and are also stronger than 2cm slabs. 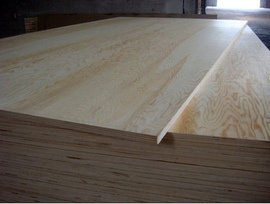 In addition, 2cm slabs will require a plywood 2 base for added strength, which may require a laminated edge to hide the plywood. This can add to your overall costs. Design. Every room is different, and the layout of your kitchen or bathroom may not necessarily be linear. Some countertops are rectangular, while others are L-shaped. Your layout can impact the final price, as the manufacturer will need to account for cutting the stone as a single piece or perhaps planning for seams 3. Finishes. There are three main finishes: polished, honed, and leathered. A polished finish has a distinct shine and is very common. Often, the polished finish is included in the base price of the stone. A honed finish has an almost matte finish and is used on specific types of materials that cannot handle a polished finish, like limestone 4. A leathered finish has more texture and still looks glossy, but it’s not available for all stone types. Edges. Purchasing a stone slab countertop includes the price of a standard eased edge, which means the sharp square corners are slightly rounded to avoid chipping. Beyond that, you can choose between many different types of edges, from the classic bullnose to the ornate ogee. 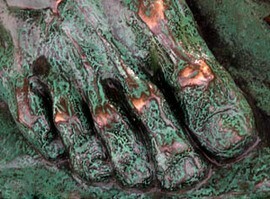 Edging is priced by the linear foot, and in general, you can expect the price to increase the more intricate the edge. Sinks. The sink is an integral component of the kitchen or bath, but the base price of a stone slab does not include pricing for a sink cutout. Your price can increase if you have a unique sink like a farmhouse sink or if you need extra holes for your sink faucet. Backsplash. 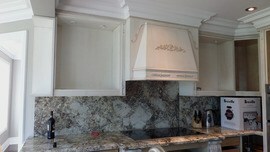 In most kitchens and bathrooms, you’ll want some type of backsplash 5 to protect the wall from splashes and splatters. You can always opt for a separate tile backsplash, but many homeowners have a matching 4-inch stone backsplash installed along the back of the countertop. Countertop removal. 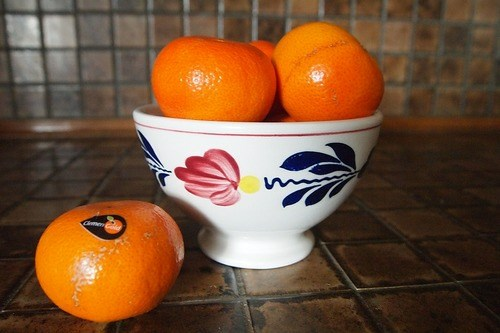 If you’re not starting from scratch, you already have a countertop in place. That means the old one needs to be removed before the new one can be installed. Carpenters can usually remove a laminate countertop in less than a day, but a pre-existing granite or marble countertop could take more than a day to remove, and carpenters charge an average of $70 per hour, so a removal job could cost anywhere from $280-$1,120. When many people think of stone slab countertops, they immediately think of granite, an incredibly popular choice. However, there are many more options on the market. Quartz A composite material made from crushed quartz and resin; usually uniform in color and available in different non-natural colors; heat, scratch, and stain resistant $50-$100/sq ft.
Travertine A member of the limestone family; variety of patterns; requires additional treatment before installation $50-$100/sq ft.
Lava A lava base with a hard enamel coating $200-$400/sq.ft. It’s also worth mentioning engineered stone. Engineered stone is man-made and the material is usually a proprietary blend of natural and synthetic materials. The end result is something that looks a little more consistent in texture and color than natural stone. Many businesses that deal in stone slab countertops will often also offer a selection of engineered stone materials. Some popular engineered quartz countertops include Caesarstone, Corian, Avonite, Silestone, and Neolith. These range in price from $36-$155 per square foot, but usually fall somewhere in the lower end of that scale. Your countertop will require some sort of edge finishing prior to installation. There are many different varieties of edging, and edging is priced by the linear foot. Some edges are double edges, which means that an extra piece has been added to the edge to create added thickness. The price of edging will also greatly depend on your countertop material. Some stones are better at standing up to cutting than others, and the ease of cutting is reflected in the final cost. While there are variants of many of these edges, these are the most common types you will see. After you’ve chosen your slab, the stone is processed. The professionals who are installing the countertop will measure your current countertop area and plan accordingly for how the stone will be cut. They will ask you for your input regarding keeping the slab in one piece or putting multiple pieces together with seams. They will also measure the sink and account for how many holes you will need for the faucet. The slab will be cut to your project’s specifications and they will also cut the edge you requested. Some edges are considered “double edges,” which means a second piece of stone is added to the edge to give the appearance of a thicker slab. The manufacturer then applies the finish (e.g., polished, honed). Professionals deliver the finished slab to your home and then it’s installed. The installation process can take up to a day and, while the sink may be placed at the same time, you will need to wait approximately 24 hours for the epoxy 8 to dry before a plumber can come in and connect the sink. The price of labor will also vary based on the material. Before you buy a slab, ask the manufacturer if the price of the slab includes the price of installation. You can expect to pay about $100 for a sink cutout and edging starting at $10 per linear foot. Hiring a contractor means you get a team of people who are experienced in installing slab countertops. Contractors are paid as a percentage of the total job cost, often around 20%. The amount of maintenance required will depend on the type of material you choose. Granite. Needs to be sealed regularly to prevent liquids from absorbing into the stone and potentially causing stains. You can expect to reseal your countertop every 1-2 years. In general, you will need to wipe spills up quickly and avoid contact with acidic liquids like wine and lemon juice. Oils can also cause stains. Quartz. Wipe the counter down regularly and clean with mild soap and warm water. No sealing is required. Marble. Like with granite, avoid contact with acidic liquids and harsh cleaners, as these can cause etching and dull the finish. Soapstone. Does not require sealing. To encourage a darker patina, rub a coating of mineral oil on the surface periodically. Before you invest in a slab, purchase sample squares and do an overnight stain test to assess any potential future problems. Also note that many countertop materials are susceptible to chipping, so avoid using the countertop as a cutting surface, and don’t bang your heavy cast iron pots and pans on the surface. Of course, stone isn’t the only type of countertop on the market. There are different countertop materials that each have their own pros and cons. If your countertop needs space for a sink, you’ll have to pay to have the required hole cut out, which can cost at least $100. The contractor responsible for installing the countertop may also be able to physically put in the sink, but a plumber will need to be the one to officially install it. A plumber usually charges between $45 and $65 per hour. Many countertops have a matching backsplash on the wall to create a seamless look and wall protection. The backsplash is typically a 4-inch strip of matching stone that runs along the wall next to the countertop. Alternatively, you could install a ceramic or porcelain tile backsplash. The average cost for a 16 sq.ft. ceramic tile backsplash is $400-$600. Stone slabs sound like they can stand up to anything, but unfortunately, they have some vulnerabilities. Some types of stone are particularly sensitive to acids and oils, including lemon juice, wine, and ammonia. These can cause etching and surface damage to the countertop, which just means you need to be diligent about spills and which cleaning products you use. Stone countertops are heavy. In order to safely transport and install the countertop, you’ll need several people involved in the job. This is usually built into the installation fee. Part of the natural charm of stone is that every slab is different. If you’re going with something like granite or marble, you’ll want to visually inspect the specific slab before finalizing your purchase. The natural veins and color spectrum can be quite different from a sample on the internet so it’s important to inspect your individual slab. Your warranty will vary based on the manufacturer and the material. Make sure your contractor will cover any potential damage to the countertop during installation. 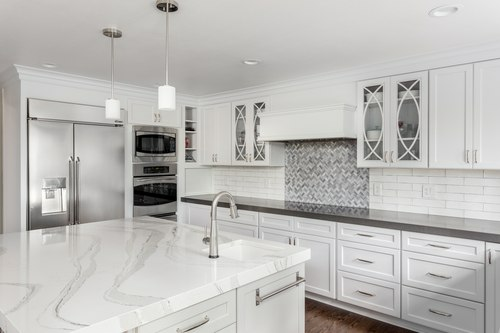 Some quartz countertops have a limited warranty, and some natural stone slabs come with a warranty-backed sealant that protects the stone from stains. It is possible in some circumstances to buy a prefabricated countertop, but that usually doesn’t include a sink cutout. It is possible to install your own countertop, but the process is labor-intensive. For an approximate cost of the stone slab by itself, you will need to contact a stone supplier. When it comes to countertops, you have a choice between a solid stone slab and what are known as solid-state materials. These solid-state materials are usually made of quartz, pigment, and a binding resin to create a consistent look. The costs are comparable, but the materials are very different in appearance, so choose based on aesthetics. There are different environmental considerations regarding countertops. 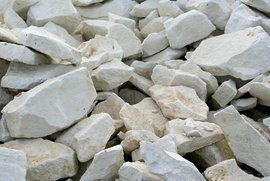 Stone slabs are natural materials, but they have a limited recycling factor. Quartz is known to emit trace amounts of radon 9, though this is not considered hazardous. When you’re thinking about the environmental impact, think about the source of the stone and the distance it has to travel. More than likely, you’re not starting from the ground up. That means you have a countertop already in place that will need to be removed. The cost of countertop removal varies based on the material. 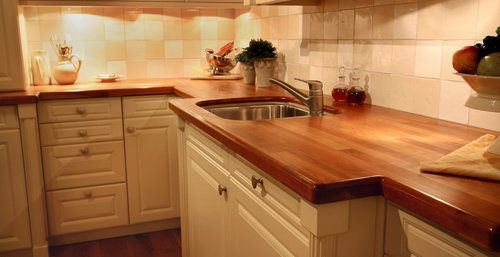 Laminate countertops take considerably less time to remove than a natural stone countertop. Expect to pay a carpenter $70 per hour for countertop removal, which can take anywhere from 4 to 16 hours, which comes out to anywhere from $280-$1,120. Many businesses sell stone slabs and offer professional installation, so the price for the stone often includes the price of installation. Prefabricated countertops are available, but their use is extremely limited. If you have an unusual kitchen, like an L-shaped or U-shaped kitchen, you’ll need a more customized approach in order to have a countertop that fits perfectly. The more out-of-the-box solutions your room requires, the more expensive it gets. How much are slab granite countertops? Different types of granite are different prices, ranging from $45 to $200 per square foot. For a 30 sq.ft. countertop, that’s $1,350 to $6,000. How much does it cost to buy a slab of granite? The cost of a granite slab depends on a couple of factors. Some styles are more rare than others and, in general, the more rare the granite, the more expensive it gets. Another factor to consider is where the granite is sourced from. A slab of granite can cost between $45 and $200 per sq.ft., which also includes the cost of installation. For a 30 sq.ft. slab, that’s $1,350 to $6,000. How much is a slab of quartz? Quartz is interesting because it is a combination of natural quartz, pigments, and binding agents. 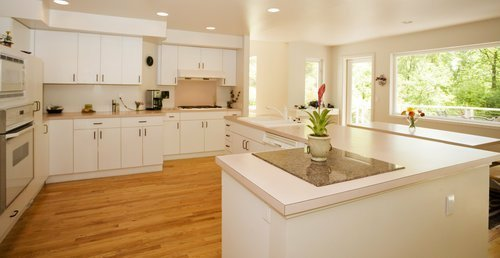 There are many different brands of quartz manufacturers, and the prices vary based on your kitchen layout, edging, and sink cutouts. 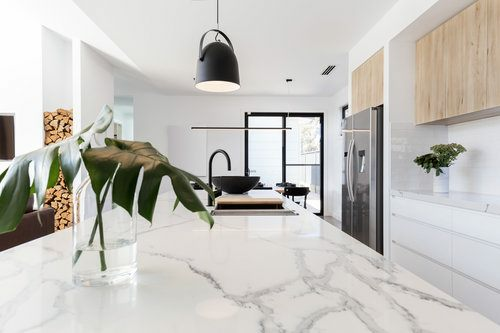 The cost of a mid-range quartz slab and installation averages between $55 and $75 per sq.ft., which comes out to $1,650 to $2,250 for a 30 sq.ft. slab. Is Corian cheaper than granite? For a 30 sq.ft. slab of Corian you can expect to spend anywhere between $36 and $68 per sq.ft.. Granite of the same size costs $45-$200 per sq.ft.. So really, it depends on the specific type of granite or Corian you want. What is the best countertop material? That depends on what you need out of your countertop. If you’re looking for fun colors, quartz is your best option. If you want something durable that will add value to your home, granite is a classic option. If luxury reigns supreme over function, onyx may be your best bet. Butcher blocks are warm and inviting, and laminate countertops are the least expensive. The least expensive type of countertop is typically a laminate countertop. These are usually prefabricated and come in many different faux finishes that mimic natural stone. The cost of a laminate countertop, including installation, is between $500 and $1,200. However, laminate countertops are lower in quality and have a much shorter lifespan. How much does it cost to install slab countertops in my city? Cost to install slab countertops varies greatly by region (and even by zip code). To get free estimates from local contractors, please indicate yours. First, a summary stating the price of the project was added at the beginning of its description. There is now information on how stone slab countertops should be maintained and cleaned. 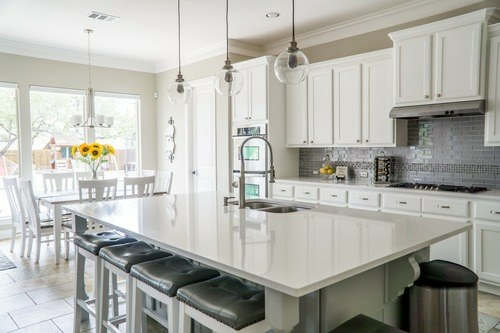 There is also a table comparing the different types of countertops, namely butcher block, laminate, marble, quartz, granite, ceramic, and porcelain. Moreover, the section “Labor” explains briefly which professionals carry out this project and how they will proceed. 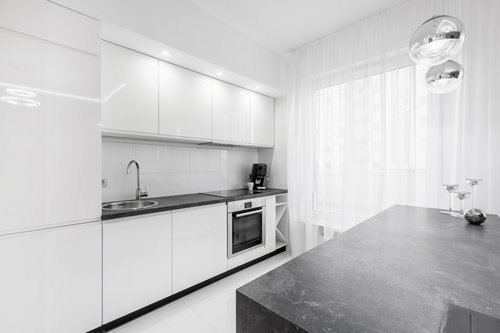 There is also a section dedicated to enhancement and improvement costs and another that contains additional considerations, such as the vulnerabilities of stone slab countertops. An adhesive, plastic, paint, or other material made from polymers containing epoxide groups. 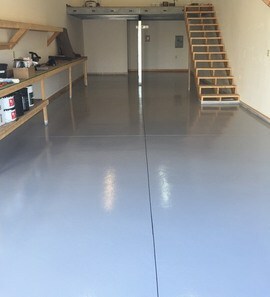 Epoxy is best used for bonding or for creating a protective coating.